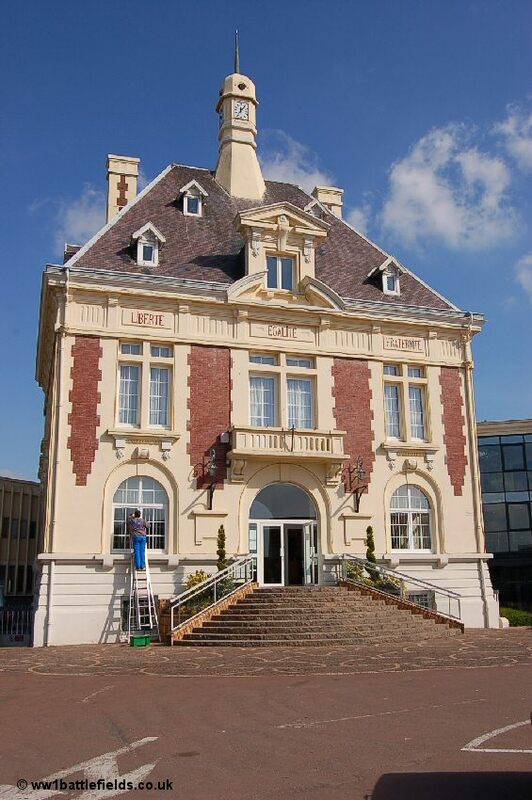 The small town of Loos-en-Gohelle can be found just to the north of Lens, and is easily reached from the channel ports by following the A26 motorway and exiting at junction 6.1. The A21 can then be folllowed to Loos. In March 1915, the British launched their first set-piece offensive of the First World War at Neuve Chapelle. This committed the troops of three Divisions on a front of about 3,000 yards. The ambitious aims of the attack were not realised, although initial gains were good. The British casualties were around 3,500 killed and 8,500 wounded. Subsequently, the Bristish mounted offensives at Festuberrt and Aubers Ridge in May 1915, as well as the abortive landings at Gallipolli. However, in September 1915, they lauched their largest offensive to date on the Western front - here at Loos. This attack comprised of six Divisions, with two others in reserve, and was on a larger scale altogether than those which had gone before in France. Early in 1916, a report was put together analysing the number of guns and expenditure of shells at Neuve Chapelle, Festubert and Loos (WO 158/259). There were, for example, 324 18-pounders used at Neuve Chapelle, whilst 540 were employed at Loos. There were significant increases in many of the howitzers as well. But it is in terms of ammunition where the difference is most apparent: over three days at Neuve Chapelle for example, the 18-pounders fired around 78,000 rounds in total. Over three days at Loos, the 18-pounders fired 163,00 rounds - and taking into account the preliminary bombardment (there was not one at Neuve Chapelle) the total rises to 366,000. So this was an offensive on a grander scale; in terms of artillery, infantry and the frontage attacked. Loos also marked the first use by the British of poison gas - following on from its use by the Germans at Second Ypres some five months earlier. Unlike Passchendaele and the Somme, the battle of Loos has received relatively little attention, but an excellent and detailed account of the battle can be found in Most Unfavourable Ground by Niall Cherry. Published in 2005, this is a thorough account of not only what happened on each day of the battle, but also of the events which led up to it and the aftermath (most famously perhaps the replacement of Sir John French by Sir Douglas Haig as the British Commander-in-Chief just three months after the battle). 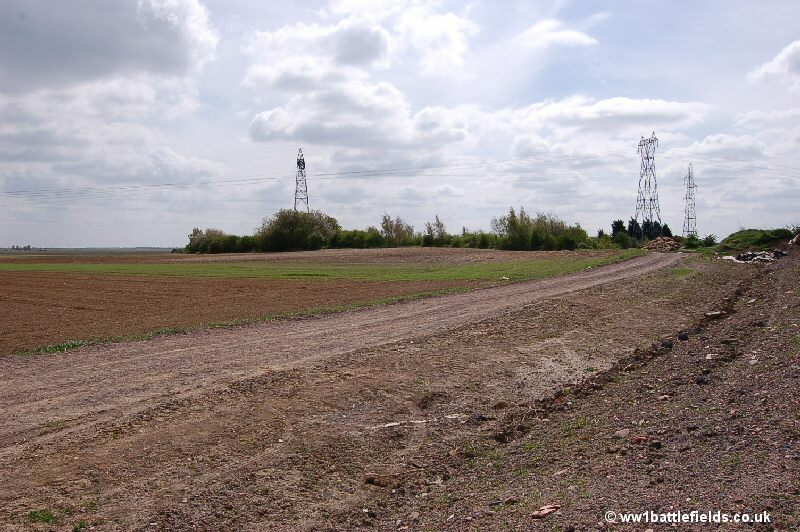 After leaving the motorway, one of the familiar features of the Loos battlefield will be seen well before reaching the town itself. 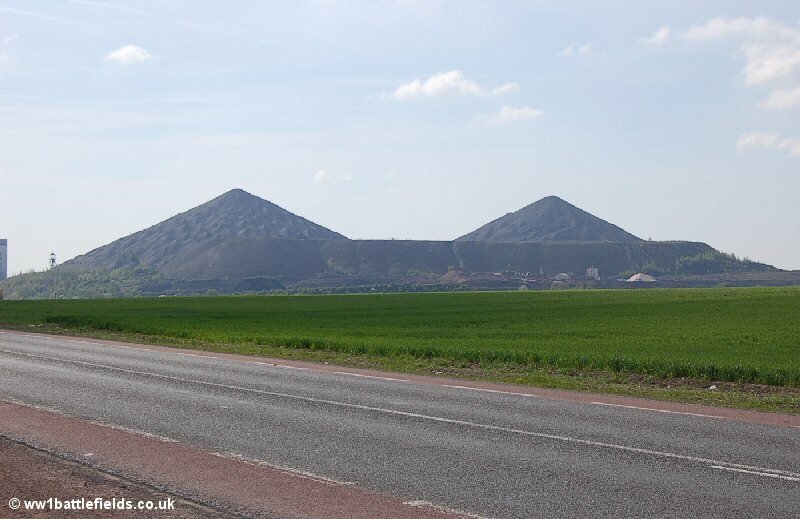 This is the Double Crassier - twin large spoilheaps which dominate this flat mining area for miles around. 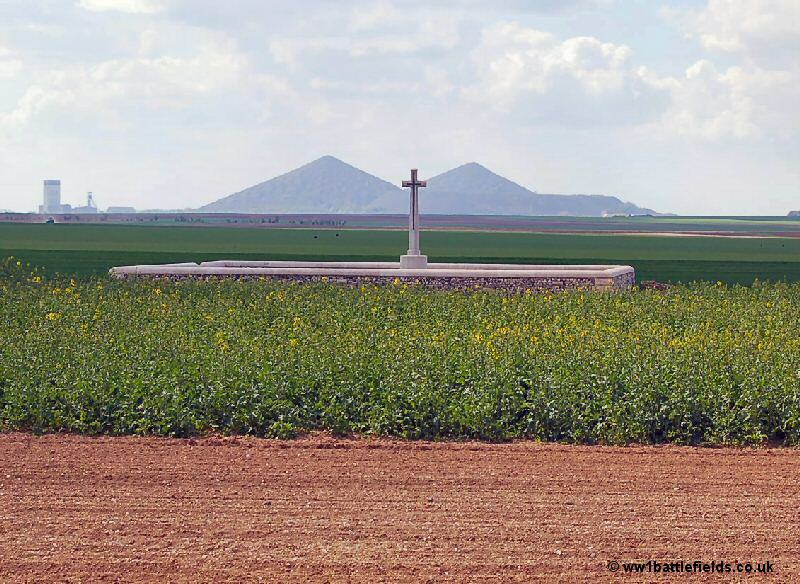 Loos is just by the double crassier. In the town centre there is a roundabout, and a parking area nearby. There is also an impressive town hall here, with the words "Libertie", "Egalitie" and "Fraternite" on panels above the uppermost windows. 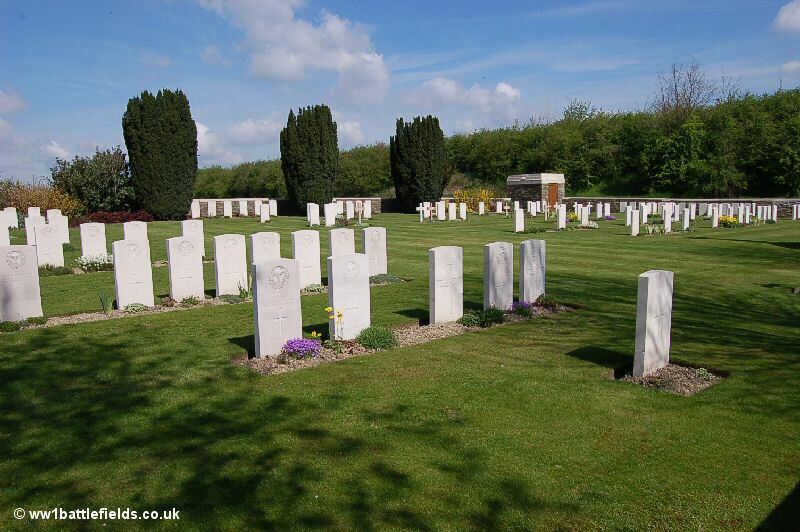 A little to the south of the town centre, and located right next to the A21 motorway is Loos British Cemetery. 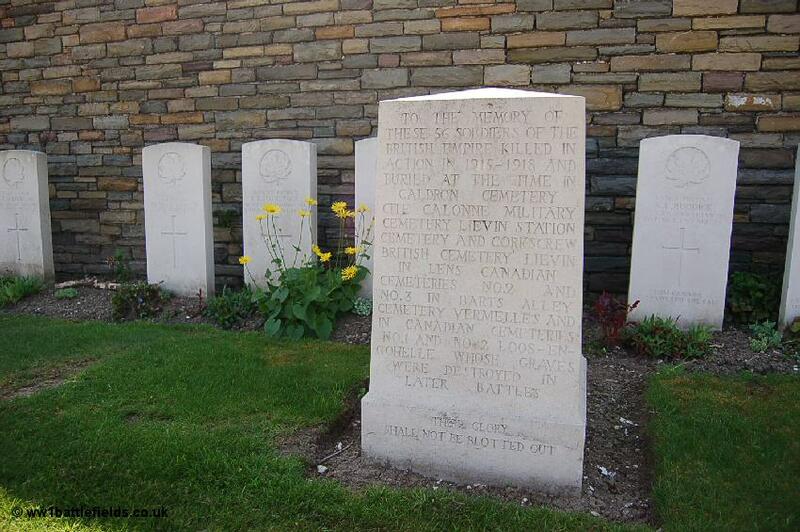 This cemetery was started nearly two years after the Battle of Loos, by the Canadian Corps in July, 1917. 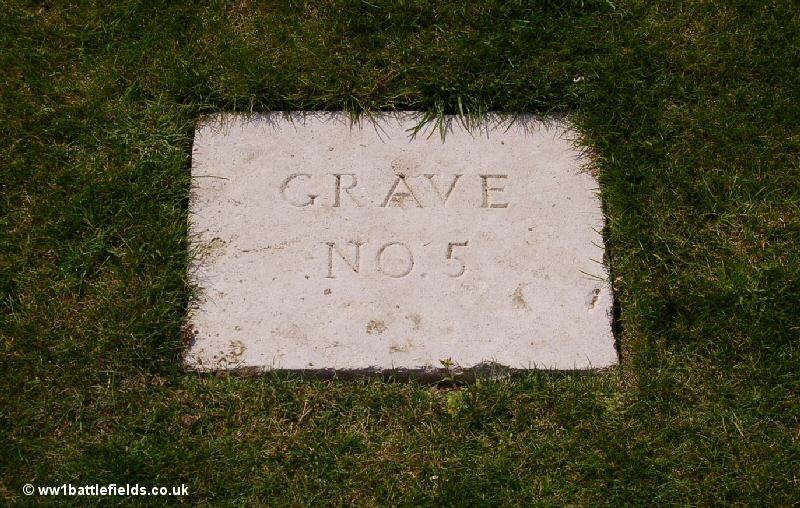 These original graves can be found in parts of Plots 1 and 2. 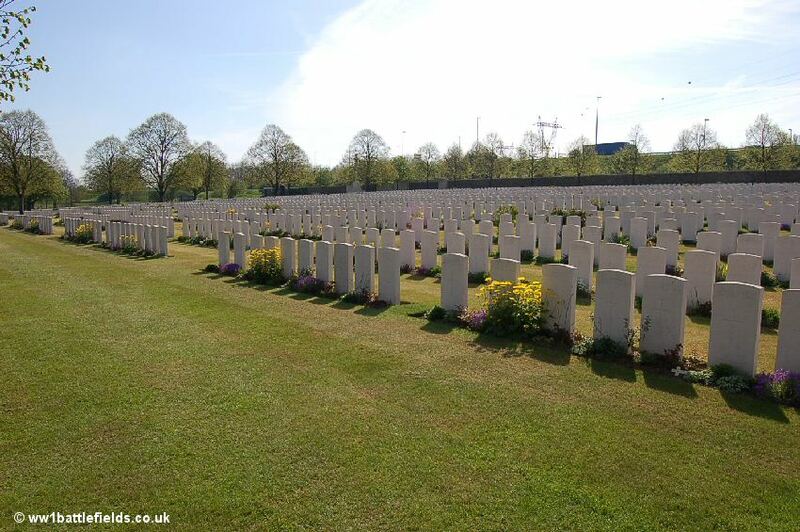 However, despite this, many who fell at the Battle of Loos are buried here, as many other graves were moved here after the Armistice from areas to the north and east. 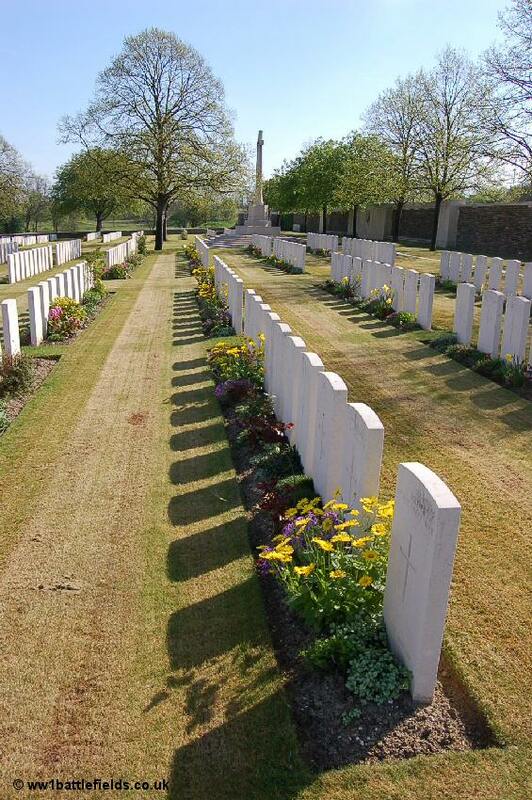 In total there are nearly 3,000 Great War burials here, and also a few graves of soldiers from the Second World War. 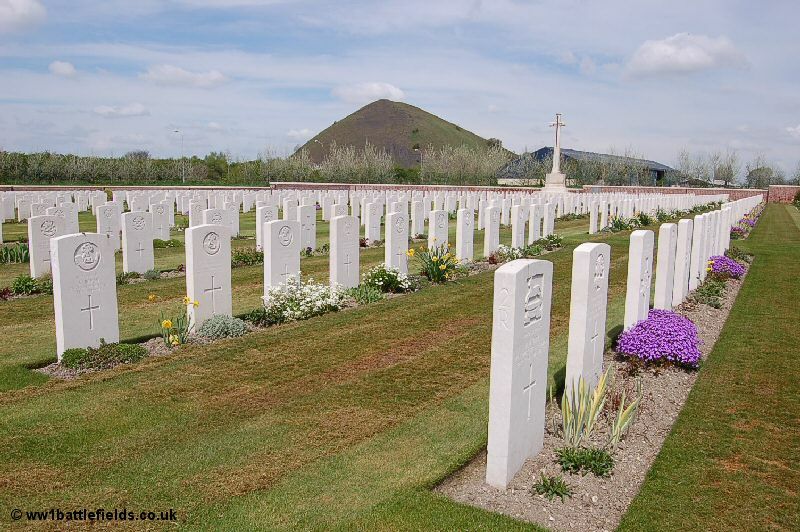 A reflection of the severity of the fighing at Loos in 1915 and the time which passed before many of those bodies were recovered is that two-thirds of the Great War burials are of unidentified soldiers - 'Known Unto God'. This cemetery is actually on the site of another famous Loos landmark - 'Tower Bridge'. 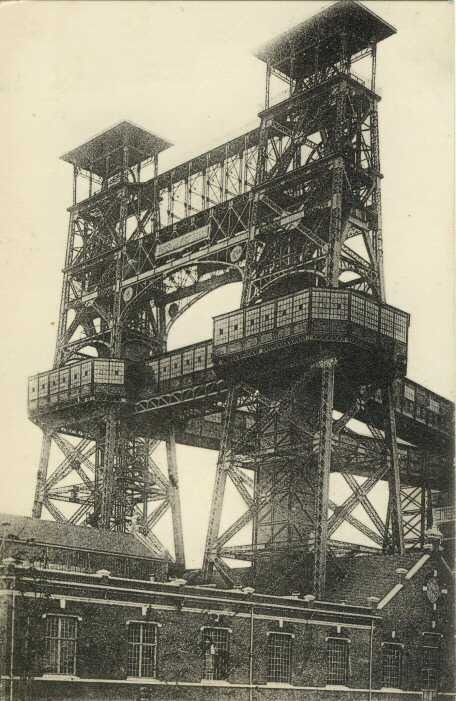 This was the name given to a pair of pithead gear towers here - also sometimes known as 'Crystal Palace'. Men from the Black Watch and the Cameron Highlanders reached this location between 7 and 8 a.m. on the morning of the 25th of September 1915 - around an hour after the infantry advance had commenced. An article in The Times on the 'Vanishing Front' published in October 1923 reported that the town of Loos was by then practically rebuilt, with a "stumpy" building having replaced 'Crystal Palace'. The cemetery is rectangular in shape and is lined at the edges with trees. 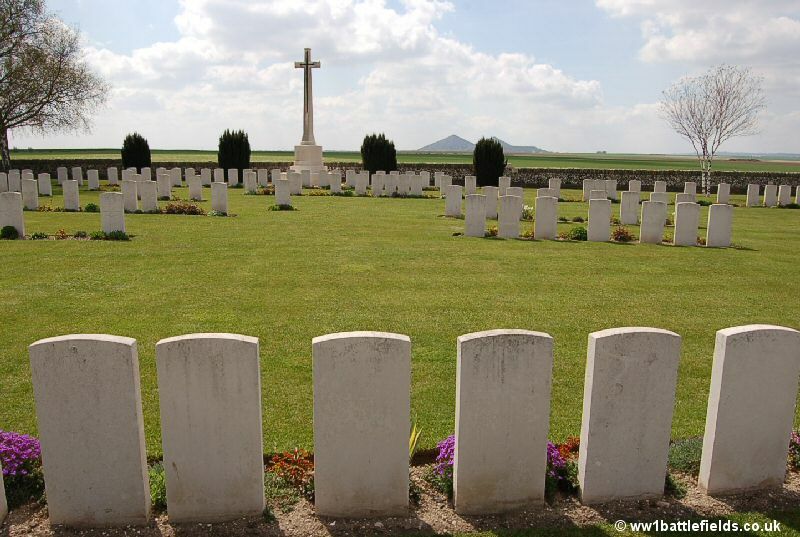 At least seven other cemeteries were concentrated here, including those from Corkscrew Cemetery in Loos. There is also at least one French grave here. At the back is a row of special memorial 'headstones' commemorating 56 soldiers who were originally buried in various other cemeteries, but whose graves were destroyed in later battles. At the rear left of the cemetery are six special memorials to men "believed to be buried" within the cemetery. Two Second World War graves are set in the space just in front of the Stone of Remembrance. 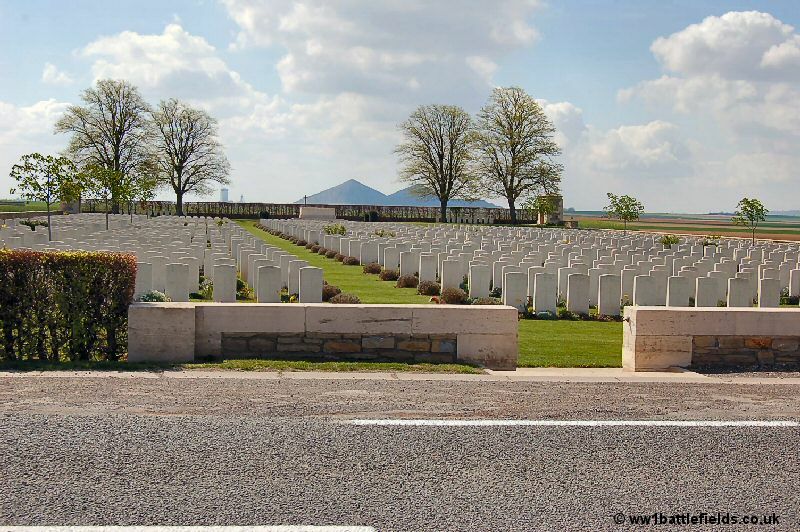 To the north-west of Loos on the right-hand side of the N43 road is Dud Corner Cemetery and Memorial. The name alledgedly comes from the large number of dud shells that lay around. Driving along the road, and from by the cemetery, the very flat nature of the landscape here can be appreciated. The double crassier is clearly visible. The front of the cemetery is open to the road, with a tower structure at either side. At the left-hand entrance building, steps lead up to a viewing platform which gives excellent views not only of the cemetery itself but also the battlefield beyond. There was a German strongpoint here which was taken by the 15th Division on the first day of the battle. 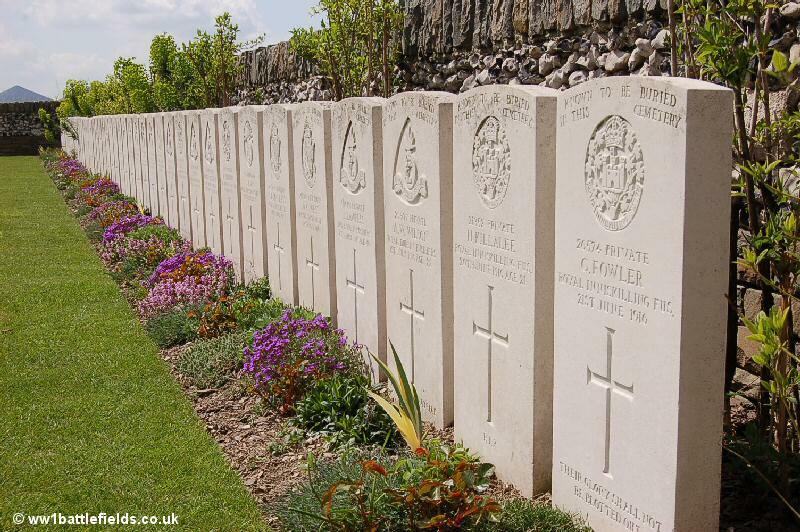 The cemetery walls along the sides and at the back are lined with panels which list the names of the Missing. The two phtographs below show the view from this vantage point, separated by several decades. 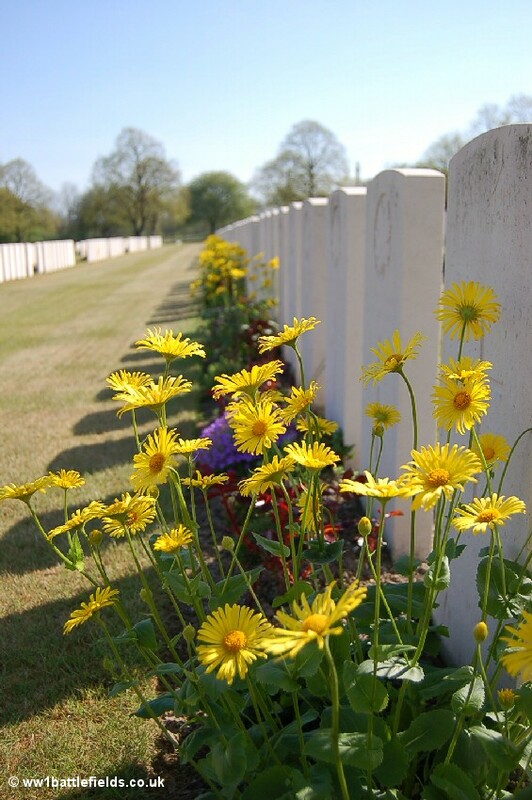 The cemetery was started during the war, but only five burials were made before the Armistice. These are now located about halfway down on the left hand side of the cemetery. The other graves in the cemetery are parrallel with the road, but four of these original graves have headstones at 90 degrees to the others. 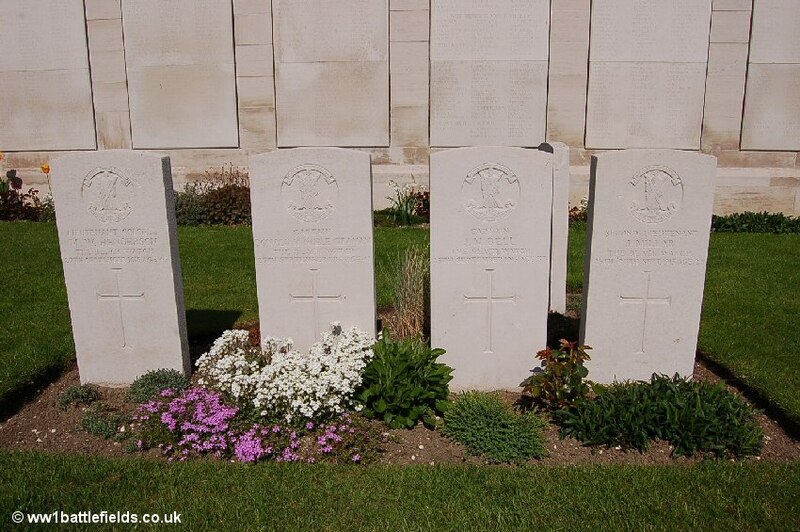 These are the graves of four officers of the 9th Black Watch, who all died during the battle of Loos, including Lieutenant Colonel Michael W Henderson. The other original grave is just behind these four and is that of Private P Byrne of the 8th Royal Dublin Fusiliers, who died in 1916. The Memorial to the Missing here, as stated above, is made up of the 139 panels lining the cemetery on three sides. These commemorate 20,597 men who died in this area (strictly from the River Lys to the old southern boundary of the First Army, east and west of Grenay) and who have no known grave. This will of course include many of those who fell at the Battle of Loos. The panels at the back of the cemetery are set in semi-circular and circular alcoves. There are excellent views across the battlefield from the back of the cemetery by the Cross of Sacrifice. 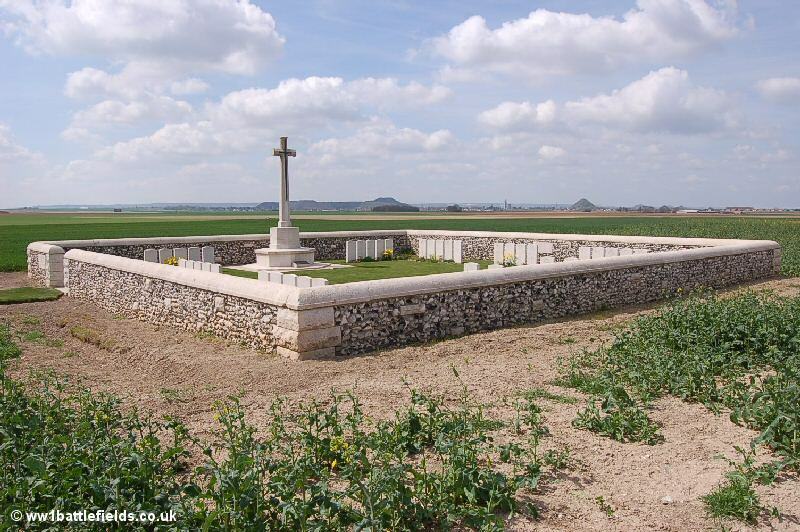 Rudyard Kipling's son John died during the battle of Loos, and for a long time had no known grave. However, a headstone at St. Marys ADS Cemetery (covered below on this page) now bears his name. There is some dispute about the veracity of the identification (again see more detail on this below) - but his name still appears here at the Loos Memorial as one of the missing of the Irish Guards on Panel 9. This is most probably because the inscriptions are updated in 'batches' rather than on a case by case basis. He is no longer listed here on the online CWGC database. At the back right of the cemetery are 15 "believed to be buried in this cemetery" special memorials. At the back left are special memorials to men buried at Crucifix Cemetery whose graves could not be found on the concentration of graves from that cemetery to here. Travelling north-west from Dud Corner on the N43, Fosse 7 Cemetery is located down a small road to the left after about half a mile. This is a small but beautiful cemetery which was also known as Quality Street (this was the name given to a small road which ran parallel with the main road here). There are two small entrances on either side of the Cross of Sacrifice. 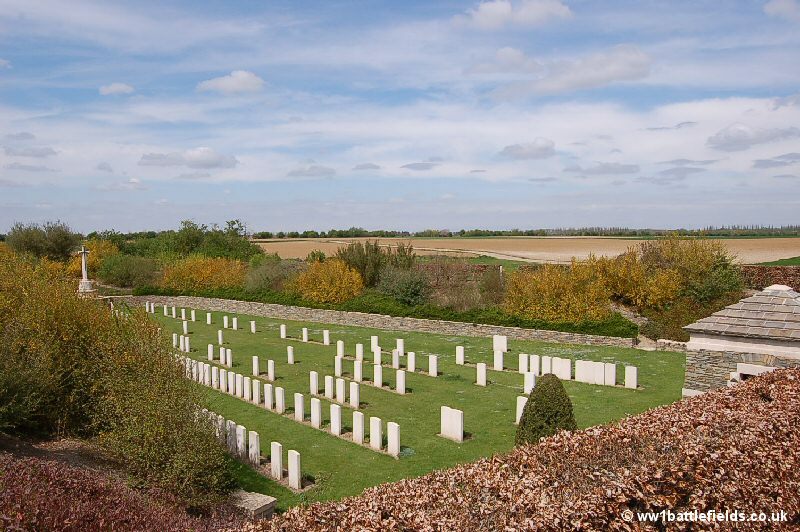 The cemetery was started by the French in May 1915 and used by the British from June 1915 until April 1917, and there are over 100 buried here with a small number of unknowns, and special memorials on the right side of the cemetery to 17 men whose graves were destroyed by shellfire. The layout of graves is quite irregular. Eleven French graves also remain; some of the crosses marking the French graves are white and some brown. The wall on the left hand side of the cemetery was damaged when I visited. Returning to the main N30 and travelling a few hundred yards further north-west, a roundabout is reached. The road that leads to the right from this, past the civilain cemetery leads along a very small road past Le Rutoir Farm. At the end of this road by a small hut a right turn leads to three more cemeteries. The first one reached is on the right hand side of the road. St. Mary's A.D.S. Cemetery is a rectangular shaped cemetery with a regular layout, and whilst there are over 2,000 buried or commemorated here, there are only 218 known graves. 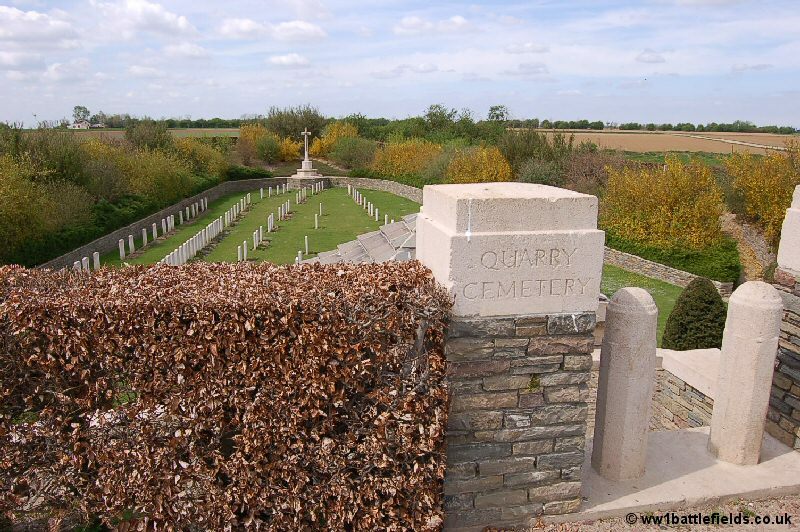 The cemetery name comes from an Advanced Dressing Station which was sited here during the Battle of Loos, although the cemetery was only established after the Armistice. This explains the extremely high percentage of 'Known Unto God' graves. Walking along the rows, it is striking how few of the headstones bear names, although some that do have more than one name inscribed, indicating multiple burials. Because of the small number of identified burials, the register is very thin for such a large cemetery. However, the name of John Kipling is listed here. 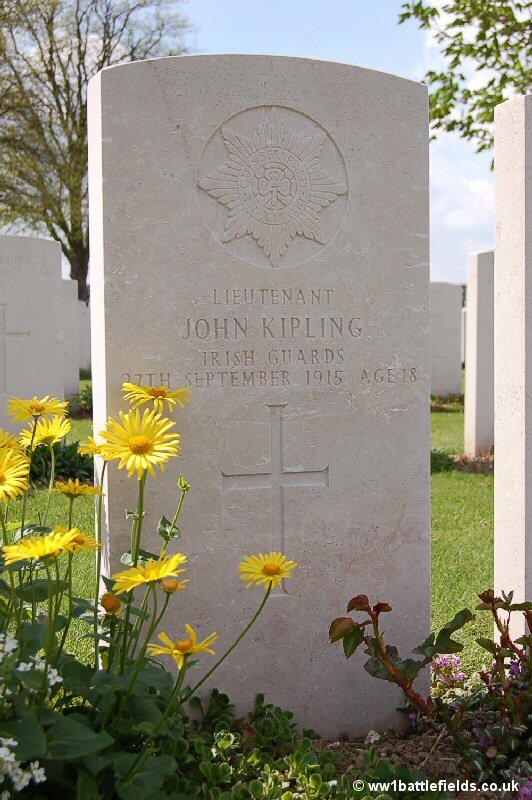 Lieutenant John Kipling was serving with the 2nd Irish Guards when he died on the 27th of September 1915. He was last seen about a mile and three-quarters south east of here, and the body listed as his was found about two miles to the south-west, so there is some dispute about whether this truly is his grave. The grave was the only one originally described as of 'A lieutenant of the Irish Guards' from the day Kipling died, and the stone was changed in 1992 to bear his name. In St. Mary's A.D.S. there are "Believed to be buried in this cemetery" special memorials at the back right and left of the cemetery, and also special memorials to men whose graves were destroyed by shell fire at the back in the centre. There used to be a French cemetery with 800 graves on the opposite side of the road from St. Mary's A.D.S., but the graves were removed in 1922. 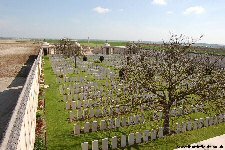 However, two other British cemeteries can be seen from the back of this one. These are reached by going a little further on the road and then taking a right turn on a small dirt track. Both the cemeteries are reached by grass tracks off to the right. 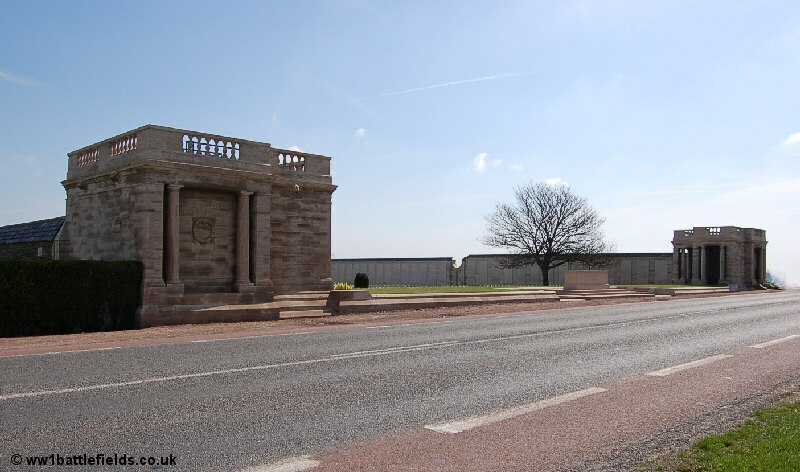 Furthest from road, but nearer to the dirt track is Bois Carre Military Cemetery. This was named after a small copse located a few hundred metres to the south west of here. On trenchmaps this was marked spelt as Bois Carree. Unlike St. Mary's A.D.S., this was an original wartime cemetery, started in September 1915 and used mainly by the 16th (Irish) Division until August 1916.The irregular layout of the graves marks this as an original cemetery, and the fact that the area was subject to enemy bombardment is reflected by the special memorials to 47 men whose graves were destroyed by shellfire. There is a long row of special memorials (shown below) marked "known to be buried in this cemetery", although one reads "buried elsewhere". The irregular layout of later graves (mainly from 1916) is especially pronounced in the far left corner of the cemetery, and on the still clear day I took these photographs this serene view made me think of Rupert Brooke's famous words. However, the situation just after the Battle of Loos was not so serene. The 1st Irish Guards were here then, and the regimental history (written by Rudyard Kipling) describes the land between Le Rutoire Farm and Bois Carre as "the ground....between the battered German trenches was a sea of shell-craters and wreckage, scorched with fires of every sort which had swept away all landmarks". The third cemetery of this trio is Ninth Avenue Cemetery, which is located between the other two and is the smallest of the group. Although around 50 soldiers are buried here, there are only four indivdual graves, and one mass grave. Special memorial stones commemorating those buried in the mass grave line the walls of the cemetery. 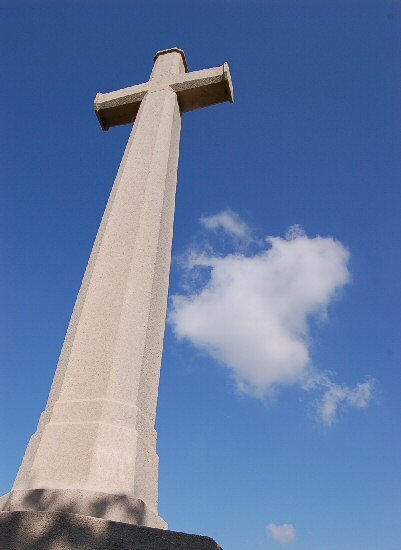 At the base base of the Cross of Remembrance is an inscription, which reads 'In grave No. 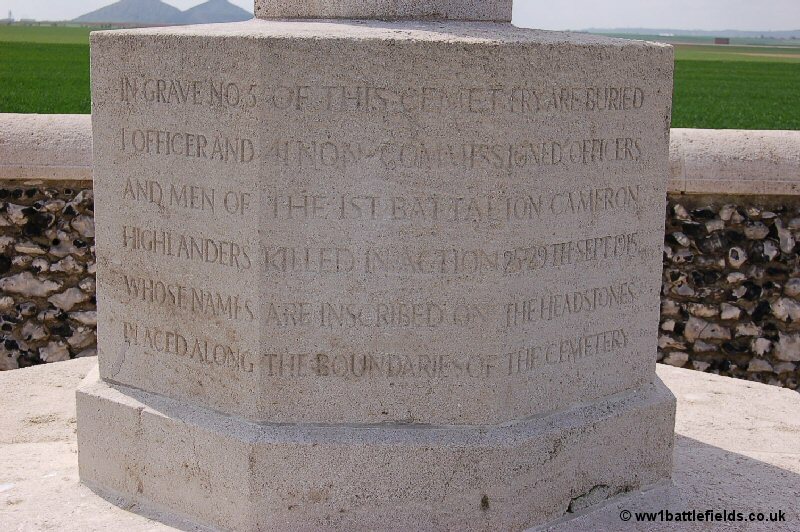 5 of this cemetery are buried 1 Officer and 41 Non-Commissioned Officers and Men of the 1st Battalion Cameron Highlanders killed in action 25-29th Sept 1915 whose names are inscribed on the headstones placed along the boundaries of the cemetery'. In front of the Cross of Sacrifice are five small flat stones laid in the grass. The central stone is inscribed 'Grave No. 5', and the four smaller stones presumably mark the extent of this mass grave. The individual graves (graves 1 to 4) stand slightly in from the wall. They are later graves, of men who died in 1916. 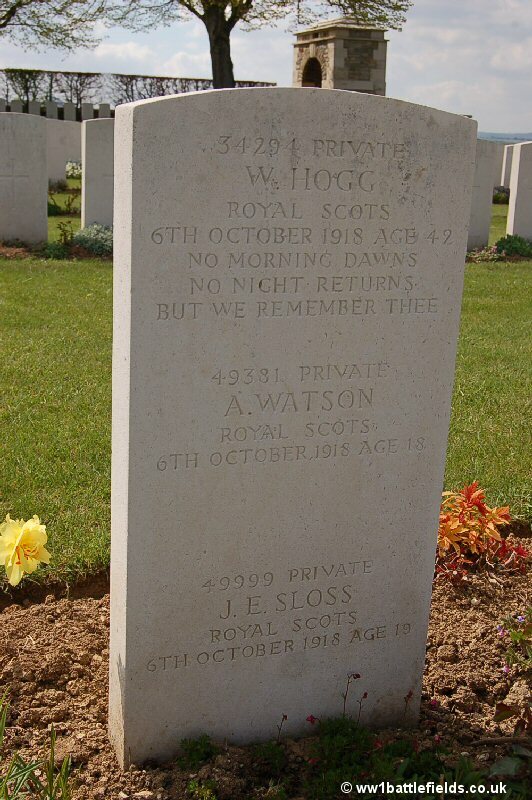 The inscription on the special memorial 'headstone' of Private James Hennessy of the Cameron Highlanders - killed on the 29th of September 1915 aged 25 - reads "The moon has arisen, it shines on that path now trod by the gallant and true". The dirt track which leads to these two cemeteries continues back towards Loos, and some way along this road is the site of the Lone Tree - which was marked on trench maps. A replacement tree was planted in the mid 1990s. The track is just about negotiable by car, but having done it once I wouldn't do it again! The track eventually comes out on the outskirts of Loos. 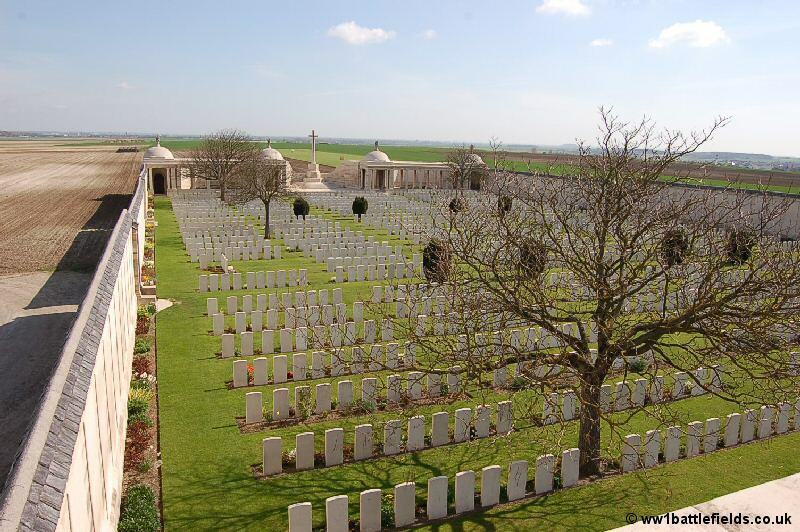 Another cemetery not far from Loos is located to the south-west of Vermelles. It is situated just off the D165E, which runs from the main N43 road from Loos and Dud Corner. 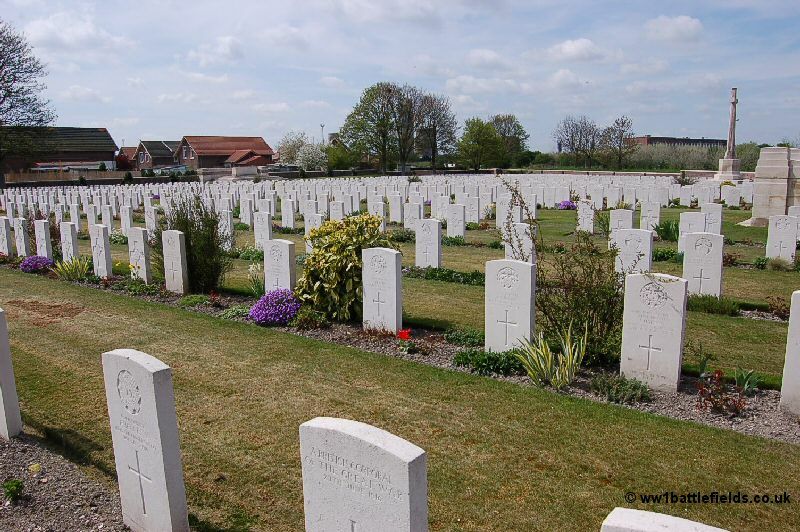 This is Philosophe British Cemetery, started in August 1915 and used through until October 1918. 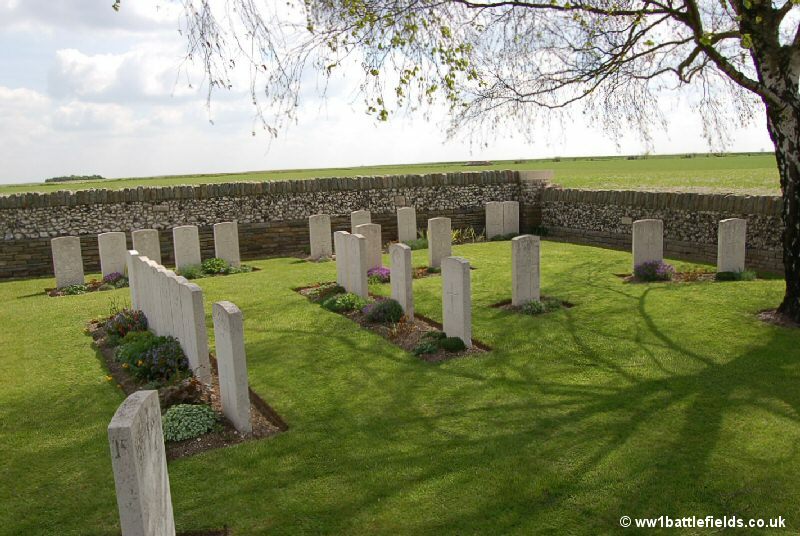 Whilst there are some graves from the Battle of Loos, many more are from later war years. In addition, graves were concentrated here after the Armistice. 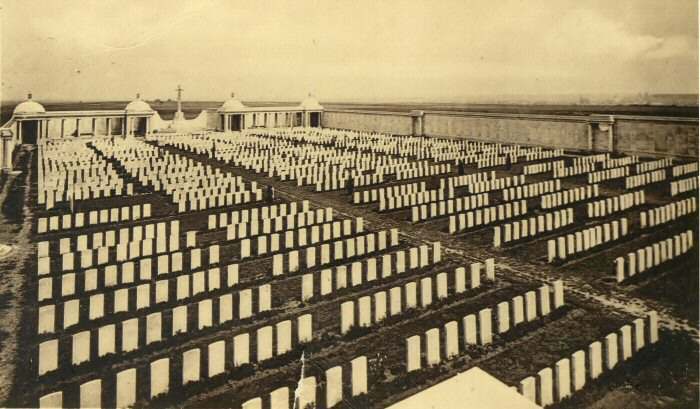 It is quite a large cemetery, and the graves in the rows at the front are noticeably much wider spaced than those towards the rear.There are just under 2,000 men buried here, with around 277 being 'Known Unto God'. The right hand wall of the cemetery curves, and this follows the route of a railway line which used to run past the wall. There is one solitary special memorial 'headstone' by the front row commemorating a soldier believed to be buried in the cemetery. 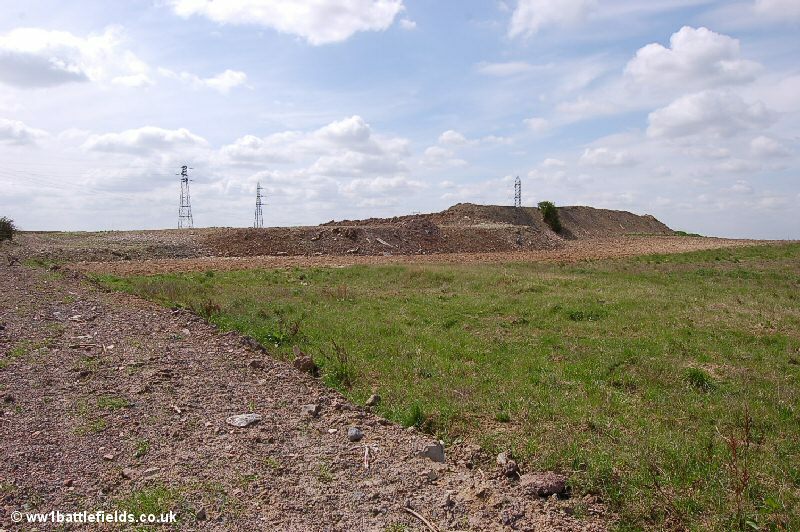 The cemetery is edged by houses on one side, and there is one of the large slag heaps which are common in the area on another. The headstone of Private John James Morris of the 1st King's Shropshire Light Infantry has the inscription "Rest dearest son, your duty done. From all at home, love there will roam". 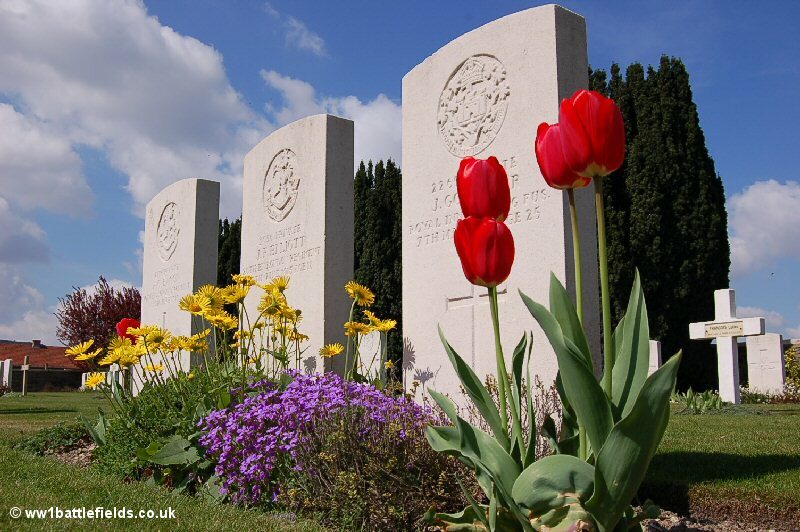 The inscription on the headstone of the Jewish soldier Private G. V. Vainstein, of the 23rd London Regiment simply says "Mother with you". Such a short inscription may have been the result of the initial policy of the IWGC, that next of kin should pay for the inscriptions by the letter. Each letter cost three and a half old pence, up to a maximum of a pound. After a while the payment was made optional. The village of Vermelles is to the north-east from Philosophe. 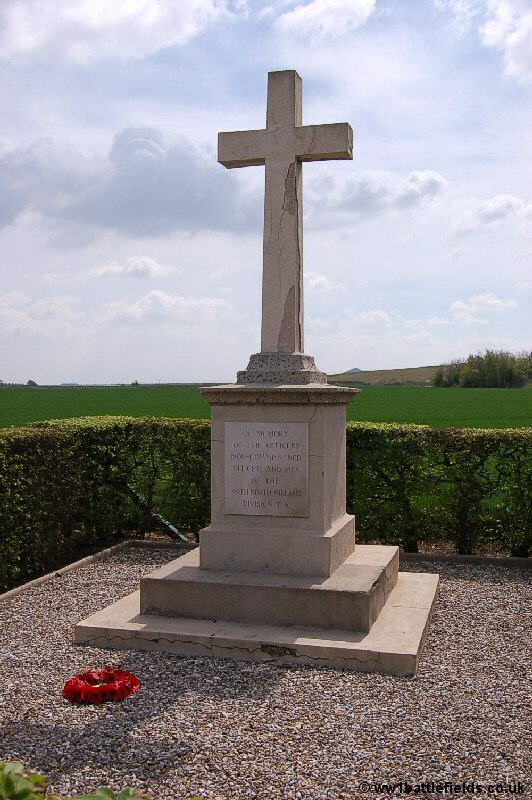 Just outside this village, which was behind the front line during the Battle of Loos, is a memorial cross to the 46th North Midland Divsion, set in a small hedge lined square. This is in rather poor condition with the stone flaking off the cross quite badly. 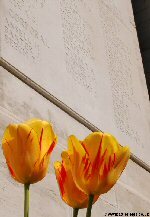 There is some more information on Vermelles on the Cuinchy & Vermelles page. Further away from the village, reached by following a small road towards Auchy-les-Mines and Cite Madagascar is Quarry Cemetery. This is up a track leading off to the right just before Cite Madagascar. The quarry which this is set in was marked on trenchmaps. From the entrance the Hohenzollern Redoubt (see below) can be seen. Stone laid paths lead down either side around the central loggia to the cemetery which is set down within the quarry. The layout of the graves is quite regular, but they are quite spaced out. It is not a large cemetery in terms of numbers; around 140 are buried here. 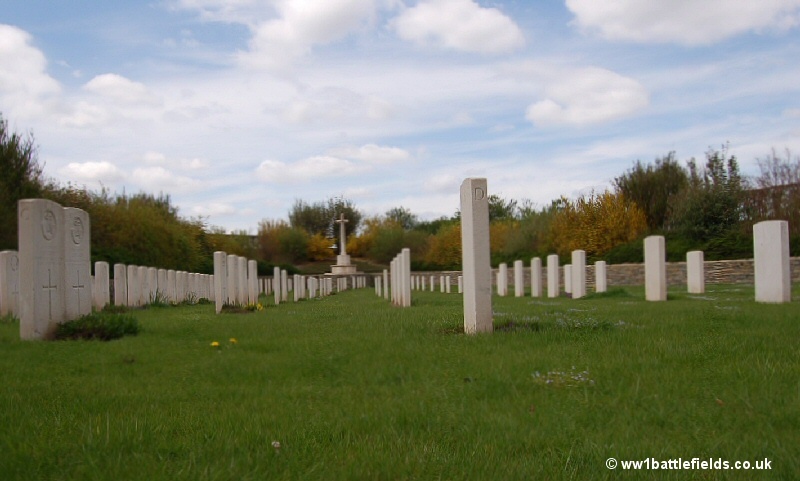 The cemetery was used mainly between July 1915 and June 1916. 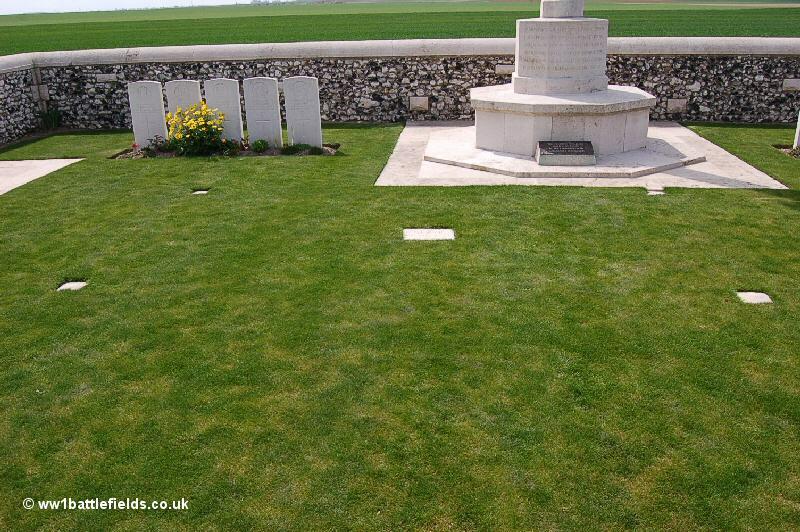 Many dismounted cavalrymen who fought in the Battle of Loos are buried here. However, many headstones read "Buried near this spot" along with the inscription at the base "Their glory shall not be blotted out". This is because, despite it's low lying location protecting it somewhat, the cemetery was damaged by shellfire and the exact positions of graves were lost, hence the qualifying words on many of the headstones. 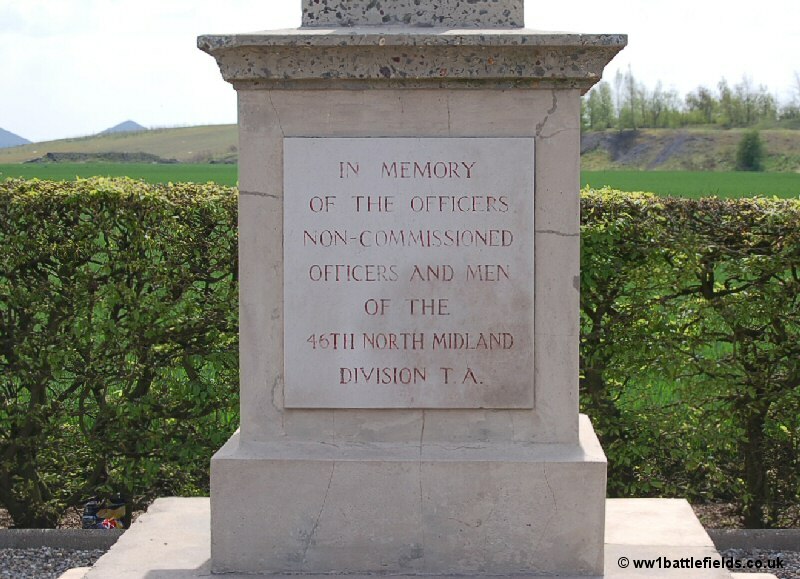 The inscription on that of Private E. Loxdale, of the 15th Londons (the Civil Service Rifles) states "They were a wall to us both by night and day". Loxdale died on New Years Day, 1916. As well as the main entrance, there is a side entrance to the cemetery, and a plaque has been placed there by the local people. One of the formidable German defensive positions during the Battle of Loos was the Hohenzollern Redoubt. 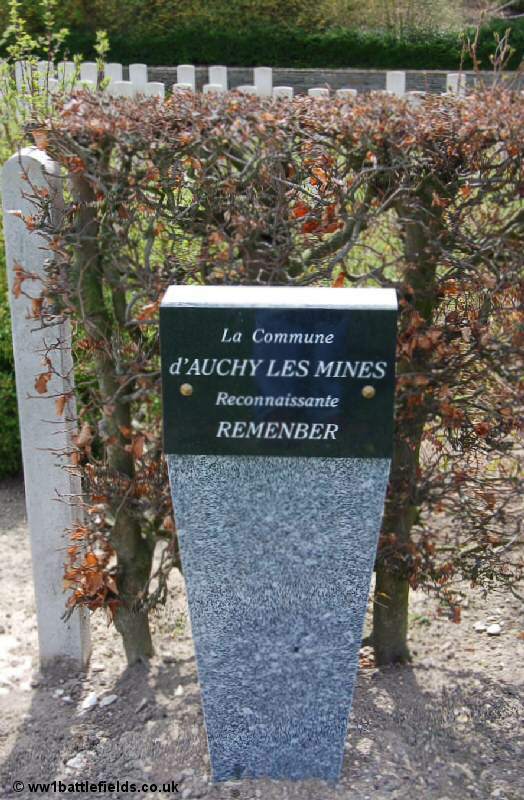 From Quarry Cemetrery, this can be reached by returning to the road towards Auchy-les-Mines, then taking a right off this road. Continuing to the end of this road, turn right past the farm located at the southern tip of Cite Madagascar. Today, there is not much to see. The area has been used in the past as a rubbish dump, but did not seem to be too bad when I took these pictures.